Nothing is better than being an entrepreneur and starting your own successful business. The rewards are immense — you get financial gains, the freedom of being your own boss, and the pride of building something that makes an impact on the world. eCommerce has opened up a whole new wave of opportunities for entrepreneurs, and one businesss that has emerged as successful is Sweden-based Happy Socks. We’ve written about them several times here on Sock Clubs, since Happy Socks are delivered in several of the sock of the month clubs we discuss, including Say it with a Sock. In 2011, Happy Socks was profiled in Fast Company Magazine, discussing how they have grown a great sock business and also developed a culture of “happiness” around their product. It’s great to see a new company disrupt a traditionally boring industry of socks! 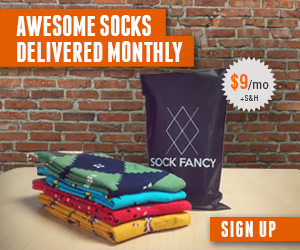 Try out Say it with a Sock to get Happy Socks delivered to your door!